This top of the range McCulloch M7053D model offers the highest specification with its front wheel drive system, and large capacity Grass bag and innovative Hi-Wheel design, this lawnmower delivers superior manoeuvrability even in the toughest of cutting conditions. The 3 in 1 system lets you either, cut the grass and discharge the cuttings onto the surface of the grass, from the side discharge chute, or you can mulch the cuttings into small particles which are then blown back onto the lawn surface. The McCulloch comes with a manufacturer’s one year warranty; and features a top of the range Briggs and Stratton engine. The rear wheels of the McCulloch M7053D are specifically designed to help with rough ground, and the mower has a cutting width of 53cm (21in) for the ultimate in petrol power and freedom it will take a lot to beat the McCulloch M7053D. 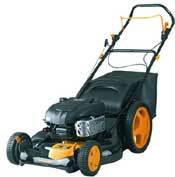 You can be the first to write a review of the McCulloch M7053D 3in1 Lawnmower. Send a review. Please help us to help our visitors by sharing your views on the McCulloch M7053D 3in1 Lawnmower.Please post a fair review and try to make your review balanced featuring good and bad points. All Lawnmower reviews submitted will be reviewed for suitability.